In episode 36 of The Paul Kirtley Podcast, I’m joined by two guests – Mors Kochanski and Jon McArthur. Many readers of this blog will of course know Mors’s name; he is author of one of the pillars of modern bushcraft literature and Mors’s place amongst the bushcraft canon needs little introduction to many outdoorspeople. 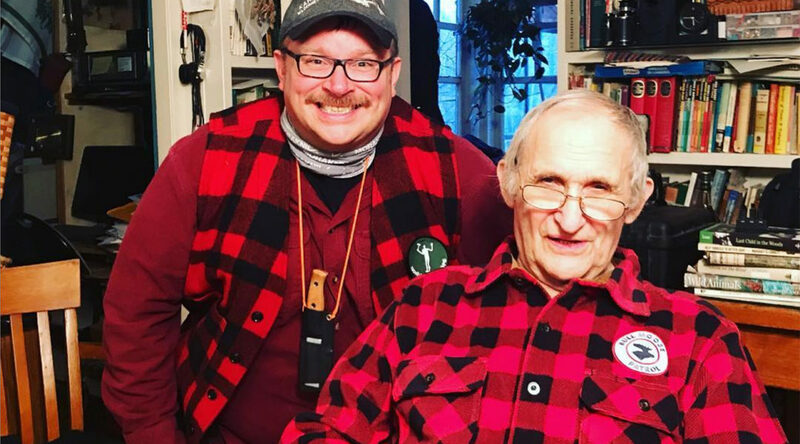 But in case you don’t know the name, Mors, born in 1940, has spent a lifetime learning and instructing wilderness living skills, teaching thousands of students, including at university level as well as through his long association with Karamat Wilderness Ways. Jon McArthur is also associated with Karamat and has been fortunate enough to be mentored by Mors. Jon is actively involved in multiple aspects of search and rescue operations in Alberta, both at the provincial level as well as within the Royal Canadian Air Force GSAR team. Jon is one of multiple volunteers on the organising board of the Global Bushcraft Symposium, which will take place in Alberta, 10th to the 14th, June 2019. One of the aims of the symposium is to connect elders of the bushcraft movement with younger instructors and practitioners. While Jon was visiting with Mors we got online for a Skype call to discuss further the aims of the symposium and who it is for. There are also some digressions and anecdotes that also add to the colour of the conversation. At times, there’s a little bit of background noise. As well as a couple of guests coming and going, there was a cat coming into the frame from time to time as well as some creaky chairs but overall, the audio is good and I hope you find this interesting and what’s more, I hope perhaps to see you at the Symposium in June. You can listen to this podcast here on my website by using the player above. Just press the play button. You can download the podcast episode .mp3 file by right-clicking on the download link to save the .mp3 file down to your local machine/device. You can also subscribe on iTunes and on Stitcher, on Player FM, Radio Public, Soundcloud, or via my podcast-only RSS feed. Finally don’t forget to leave an honest review & rating on iTunes or on Stitcher. Ratings and reviews are extremely helpful and greatly appreciated! They do matter in the rankings of this podcast and I read each and every one of them. Paul, this is again a good podcast. Mors is one of the instigators and culprits of modern bushcraft, and the young and upcoming bushcraft and survival wannabees had better be well acquainted with his work, as well as with the works of all the other ‘greats’ who will speak at this symposium, including you. Since joining your circle, I am continually humbled by your own knowledge and experience (and downright envy you a bit, lol, for the freedom you seem to have to go out there and do these things), and the excellent content you share openly on your podcasts and blogs is inspirational, informative, well organized, and extremely relevant. I think you would most qualify to write a book, or five, categorized in firecraft, plant lore, seasonal methods, navigation, knife craft and axe craft, as well as in wilderness first aid, for starters. I will bring my daughter to this symposium, which I believe will benefit immensely (and who is nervous about it, being in the presence of such bushcraft and survival Titans), because she will have the opportunity to take the baton and continue the relay race towards factual and true survival and bushcraft techniques, so she can relay to the generation that follows her. I also look forward to meeting other members of our circle (Frontier bushcraft online community) who will attend. As always Marcel, thank you for your kind and considered comments. Looking forward to meeting you and your daughter at the GBS. This is a general comment and a big thanks. I run a range of nature based activities and have worked in the environment for years. I studied and tried out Bushcrafts ‘here and there’ when I could, and finally got my Bushcraft Competency Certificate a few years ago, giving me the confidence to feel genuine enough to pass on skills to others. of course in reality I am still a beginner. Your podcasts blogs and way of sharing has continued to consistently teach me more than other sites online, and I have taken things learned from you and used them out in the big real world. So a big thank you for all your honest and skilled work. Thank you for your positive words. I’m very glad my materials here are helping you on your own journey into bushcraft and, in turn, your ability to share what you know with others too. I appreciate your support and I’m glad my work is supporting you too. Hi Steve, it’s good to hear from you. Thank you for your kind and positive words about my work. I’m glad you enjoy these podcasts. Feedback such as this definitely spurs me on to make more of them. More generally, I’m glad my online materials and field courses have been so beneficial to you (and by extension your family).